The Joy Fold is one of my favourites and I haven't made one for a long time - until now. There are many great tutorials available on You Tube, so I won't go into too much construction detail. Suffice it to say that I used Bermuda Bay cardstock for the card, layered with Pool party. I should use the Watercolour Wings stamp set more often - it's a beauty! I stamped all of the Pool Party panels for the larger part of the card with the beautiful flourish from the First Sight stamp set. I used Basic Grey ink for the front panel and the large inner piece and Bermuda Bay (stamped off) for the inner left side to surround the greeting. 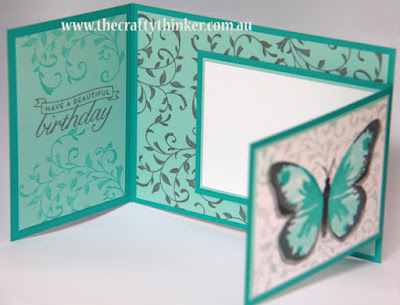 The greeting is from the Birthday Blossoms stamp set. 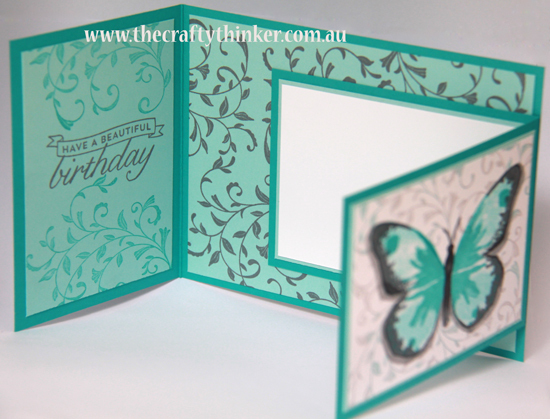 I layered a piece of plain Whisper White cardstock to the inside of the small section of card. This is where I'll write my message. I stamped the large triple stamp butterfly from Watercolour Wings onto the small piece of Whisper White card for the front. The colours I used are Basic Grey and Bermuda Bay. I used markers around the edge of the butterfly and added a shadow with a Smoky Slate marker. 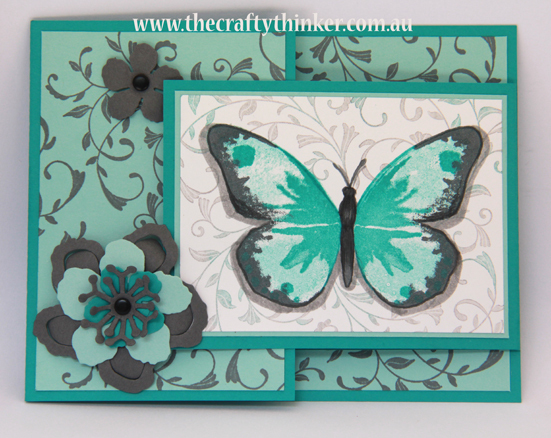 Then I masked the butterfly before stamping the background with the same flourish - but this time inked with Smoky Slate and touches of Bermuda Bay and Basic Grey. I stamped off first so that pattern wouldn't overwhelm the butterfly. For the closure, I added a flower made using the Botanical Builder Framelit set and added another small flower to balance the composition. I gave the flowers Basic Black candy dot centres.